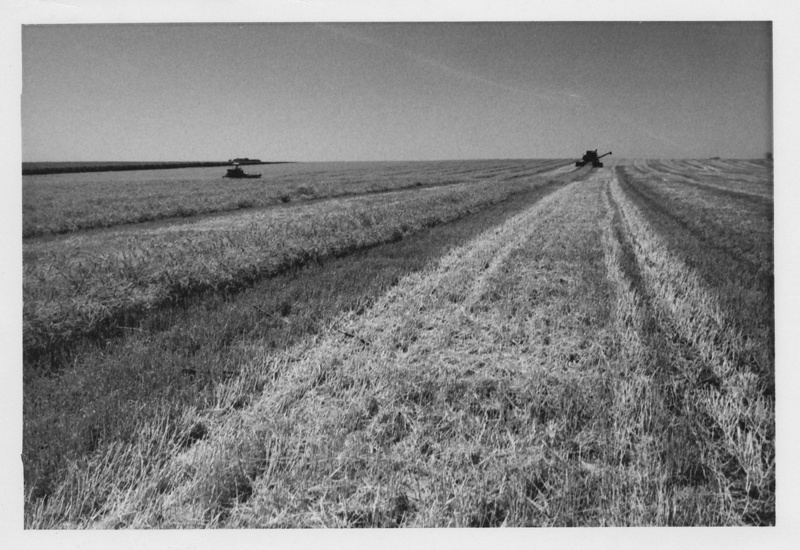 The photos below are of Bill Shimon’s (my husband) July 23 and 24, 1976, wheat harvest. The location is Section 23, Roosevelt Township, Pocahontas County, Iowa*. 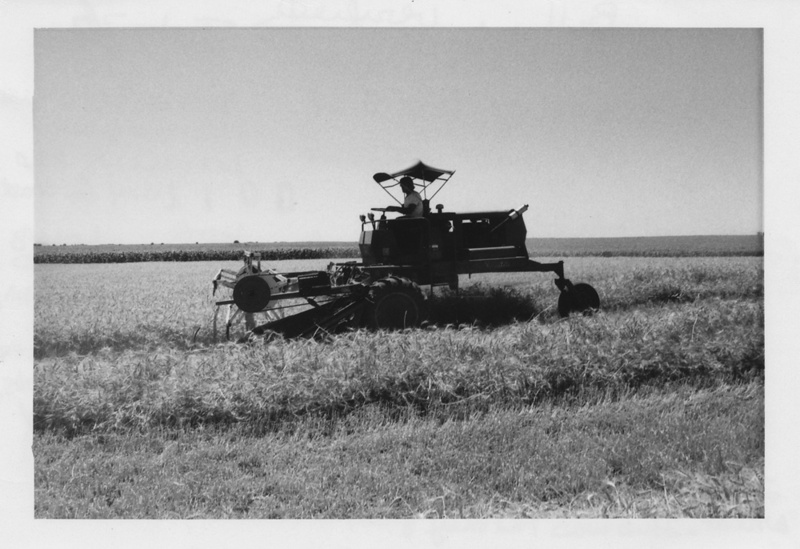 Growing wheat in northwest Iowa was, and still is, very unusual. 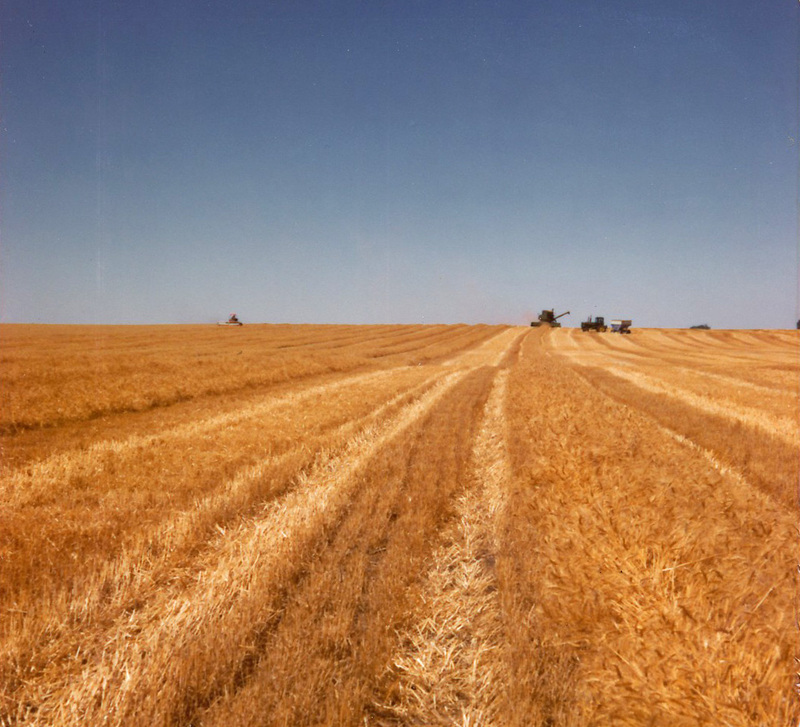 With corn prices recently surpassing wheat prices, I thought it a perfect time to tell about Bill’s 35-years-ago wheat crop. The audio at the links immediately below explains the photos better than the captions do. 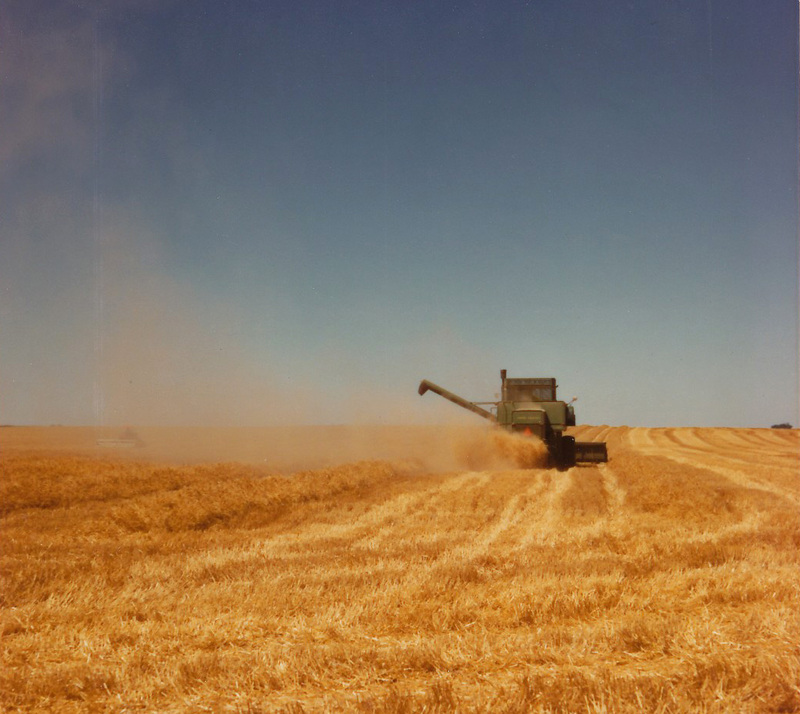 Part I audio (6 minutes): Where and why Bill raised wheat, how it was marketed and to where it was transported, why oats are not grown as much as in earlier years, and a summary regarding different kinds of wheat. Part II audio (5 minutes): A description of the operation in Photo #2, below, and an explanation of the machinery Bill used, including his own engineering. 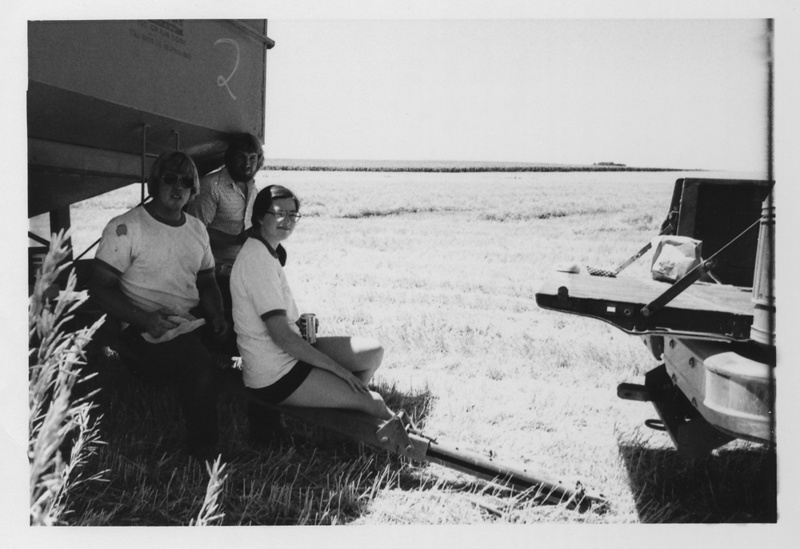 Part III audio (4.5 minutes): The moisture content, test weight and yield of Bill’s 1976 wheat crop, as well as a brief discussion regarding protein in wheat. 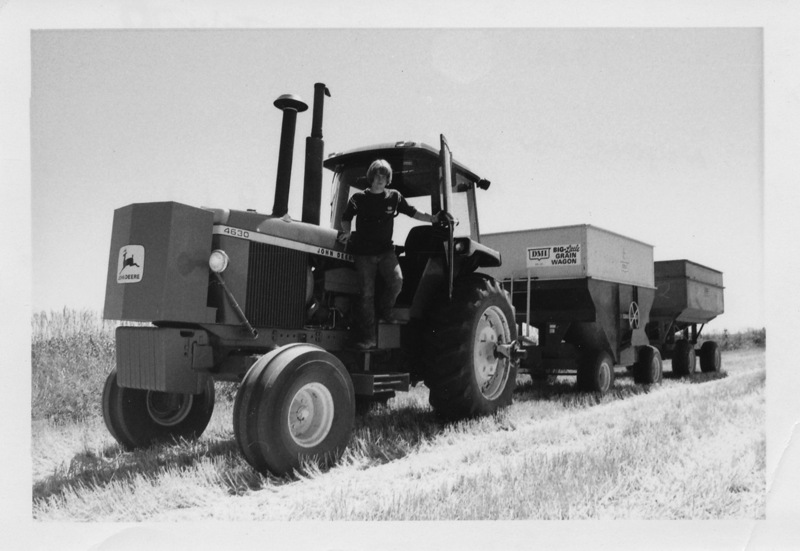 Bill got his start in farming at the age of 12 or 13 years (about 10 years before these photos were taken) when he, along with one of his brothers, first rented farmland. At the time of the photos below, Bill was 23 years old and involved in a farming operation with his dad and brothers. Subsequently, Bill had his own farming operation until 1985 when he embarked on his farm management career**. I hope you’ll listen to and enjoy the audio. I know that some of the photos below are a bit redundant, but I’m posting all of them for the sake of posterity. Clicking on any of the photos will enlarge them. Bill is swathing (windrowing) wheat with a swather. The swather cut the wheat leaving a stubble of about 6" to 9". 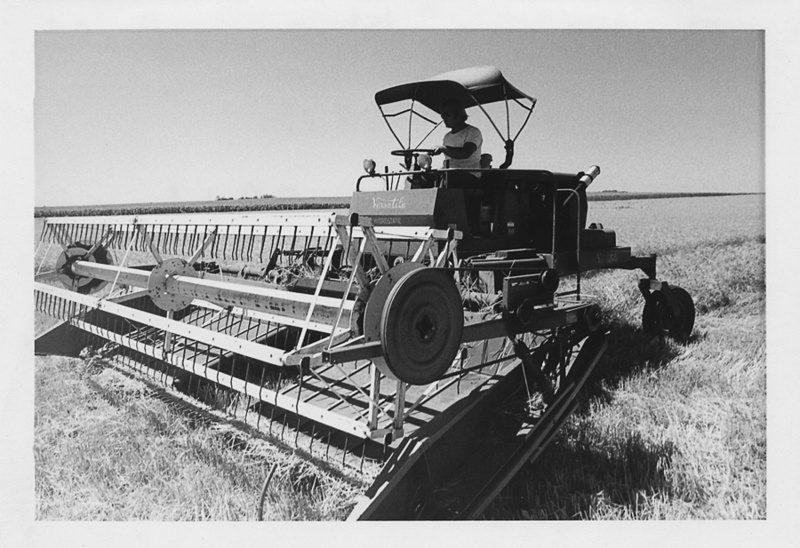 The swather then placed the rest of the wheat plant on top of the stubble in an approximately 3'- or 4'-wide row called a swath. Photo #2: The operation in this photo is described by Bill in the "Part #2" audio segment. The camera is "looking" west. Between the stubble at the bottom of this photo and the swather is a swath. To the left of the combine is a swath. The swather is at the far left. The combine is moving toward the camera and is picking up a swath. The swather is at the left. Bill's second-to-the-youngest brother Tom is pictured. As is still the norm, the moving combine dumped the grain into the also-moving wagons, i.e., on-the-go. The pickup that picked up the swath is the kind of nubby looking thing at the lower left of this photo. Because the swath is only 3' or 4' wide, the outer portions (ends) of the much wider bean head (technically called a grain platform) were not involved in this wheat process. The pickup picked up the swath and fed the swath through the middle of the bean head (which is at the far left just behind/above the auger in this photo) and into the combine. In this photo you can also see, to the right of the pickup, the round hydraulic motor. Bill engineered the attachment of the hydraulic motor to the pickup. 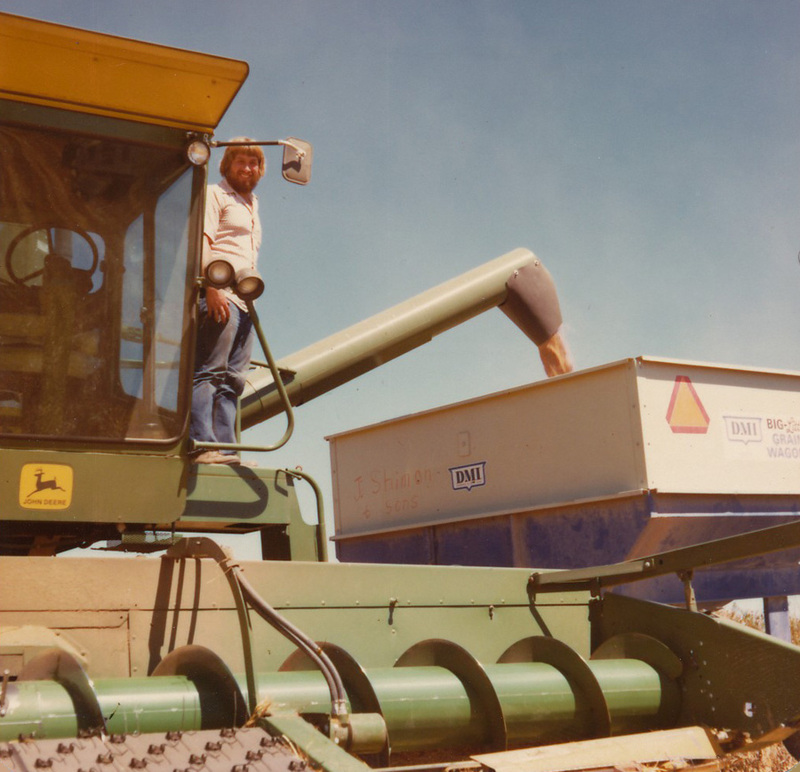 This photo is a very atypical scene, since almost always the combine dumped grain into the wagon while both were on-the-go, instead of both being stationary as in this photo of Bill's brother, Mike. L to R: Bill, Mike (Bill's next-younger brother) and I (Louise) are having lunch in the field. *This location of this wheat field is between the towns of Rolfe and Pocahontas in northwest Iowa. **I had several paragraphs written telling about Bill as a farm manager. However, my enthusiasm regarding how he interacts with the land, his clients and his farm operators sounded kind of gushy. I’ll just say that his work ethic and management style involve getting his hands dirty…a lot. This entry was posted on August 4, 2011 at 10:17 pm and is filed under Uncategorized. You can follow any responses to this entry through the RSS 2.0 feed. You can skip to the end and leave a response. Pinging is currently not allowed. Go ahead and gush, Louise. It’s great that you still feel that way about your farmer….and support all his efforts and wonderful qualities! “Can’t stop lovin’ that man of mine”….whatever song that line is from and whoever sings it. You two are still so cute together, even a few years after lunch on the wagon tongue! One of my first times taking “lunch” to Gus in the field, I took a casserole. Funny now, but I thought he’d want a nice lunch, and I do know farm wives who serve a meal off the tailgate like that. Gus kindly told me I could just bring a sack lunch, that they didn’t usually stop to eat. Oh. Nevermind. Agree with Nancy’s post…. to go ahead and gush – and you two being cute together. Thanks for sharing all the information and photos.